AUTUMN SALAD. 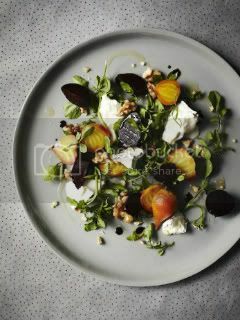 PHOTOGRAPH BY SHARYN CAIRNS, STYLING BY DEB KALOPER. I've known several people who have done it for a living, and each one would tell you it's all about the creativity. So when you pick up a cookbook, flip through a gleaming food magazine, or visit your favorite cooking blog, never forget that the mouth-waterng creations you see --weren’t just the creations of a cook. Food stylists, photographers, and art directors are crucial to that final shot—making sure a salad stays farm-fresh instead of wilted throughout a long photo shoot under hot lights. Well, the Morning News has brought together a panel of experts from the food world to talk about in-camera work vs. retouching, the visual appeal of organic vegetables, and what to have for dinner after a long day of playing with food. The results are in, and this past week most of the country's best chefs got together at Avery Fisher Hall here in NYC for the James Beard Foundation's annual chef and restaurant awards ceremony. Eleven Madison Park (Outstanding Pastry Chef, Outstanding Restaurant), José Andrés (Outstanding Chef), Richard Melman (Outstanding Restaurateur), and Jean-Georges Vongerichten's ABC Kitchen (Best New Restaurant). But then again, there were some other chefs who took home medallions, too. 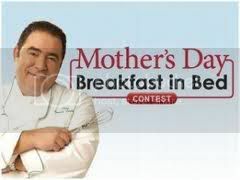 Outstanding Chef Award: José Andrés, minibar, Washington, D.C.
What better way to celebrate Mothers Day, than winning the Emeril's Breakfast in Bed Contest on GMA? (Honestly, can't think of one!) Gotta love that Emeril Lagasse. What a natural-born lover of "people." Really says a lot -- and that's why the world loves him. Anyway, watch this clip featuring past winners, and Happy Mothers Day!